Description: Northbound Coal Train to Roberts Bank BC hits SeaLine Jct at Everett. Description: BNSF 4148 is only a car length behind the last car in its train at the grain transfer facility in Kalama. Description: BNSF 4148 approaching the grain transfer facility in Kalama. Description: On the first track from right to left is FURX 7285,BNSF 8625,BNSF 4144,BNSF 533,BNSF 7283,BNSF 150 and on the next track over is a BNSF GP60B,BNSF 4148,BNSF 6831,BNSF 653,FURX 8109 and on the far tracks with UP 9590,BNSF 4804,CSX 8510 and BNSF 4154.The other engines I didn't get the numbers to but there is a BNSF SD9 a NREX SD40 and RLCX B39-8 back there too. Description: DPUs on BNSF 4585 East. Description: A northbound Q train crosses Norfolk Southern's NA district. Description: Northbound Q train gets run around a waiting V train at the north end of Clifton. Description: Northbound Q train clears the north end of Clifton and rolls onto the dragging equipment detector at Pleasant Grove Rd. On this line, DED's beep twice on the radio for no dragging equipment, while hotbox detectors use the usual voice instructions. Description: Northbound Q train accelerates the J.B. Hunt containers past the 679 mile post. Description: A BNSF crew spins the 4148 and 336 around the wye at Alliance Yard. Description: BNSF ballast train at WR Tower. Description: Two DC GEVO's and a Dash 9 bring a heavy ballast train past the old Cotton Belt Freight House in north St. Louis. Description: GE Power leads a BNSF Freight through Santa Fe Jct. with an unusual load on the second car. 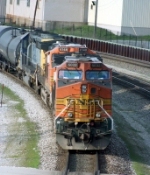 Description: Part of a six engine powered BNSF mix in the KCS-Corpus Christi Yard.